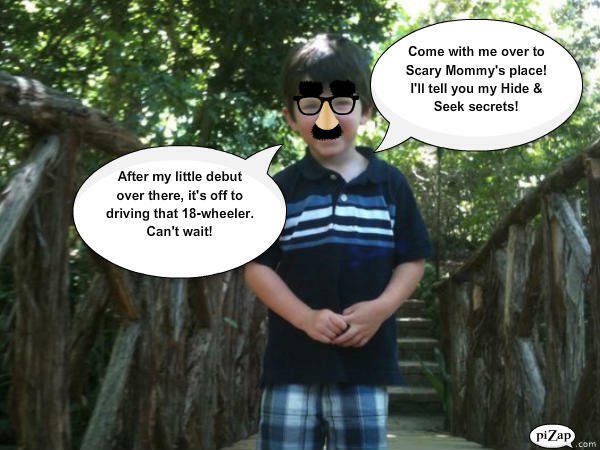 My 3-year-old and I are over at Scary Mommy‘s place talking about A Preschooler’s Guide To Playing Hide & Seek. Jill, the awesome “scary” mother herself, has an amazing blog. She has been featured in The New York Times, Target, Ms. Magazine, CNN, MSN NBC and The Washington Times. A section of her blog, The Scary Mommy Society, showcases the work of her readers. I am thrilled to be over at her place today! My son wrote it the hide & seek piece. He’s really smart. He never even asked me how to spell any words. I’m so proud of him. On top of his writing abilities, he also just got his truck driver’s license. He starts driving across the country in an 18-wheeler full of gasoline on Monday. He makes us proud. He is hoping Jill likes his writing and puts a good word in for him at Target. He would like to own every one of the huge bouncy balls in the gigantic cage and knows Jill may be able to work this out. I told him not to hold his breath. For real, because…well, TAKE A BREATH! I LOVE YOU, SON! Click here to read his Hide & Seek Guide if you care anything at all about building his fragile, still-developing self-esteem.